Versatile rosewood finish Oriental 1" wide wood ball stands. Great for small spheres, marbles or eggs. These stands hold 20mm or 3/4" to 50mm or 2" spheres or eggs. Classic and simple walnut finish wood egg or sphere stand will add elegance to your sphere, marble or egg collection. This wood stand holds spheres, paperweights or eggs from 45mm or 1 3/4" up to 80mm or 3 1/3" diameter. 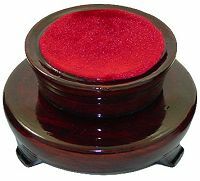 Clearance sale for small solid Rosewood rotating Egg or Sphere Stands with red felt lining. These rosewood stands contain bearings that allow you to rotate the upper portion of the stand, comparable to a "Lazy Susan". Perfect for showing off gemstone spheres, globes, crystal balls and Art Glass. Deep Rosewood finish, these stands are handmade. Attractive 1 3/4" W brown mahogany finish solid wood stand. 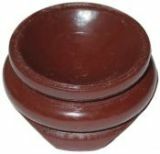 Use for spheres, marbles or eggs from 45mm or 1 3/4" up to 80mm or 3 1/3" diameter. 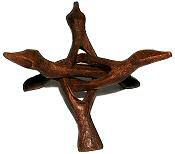 Versatile wood tripod puzzle stands from India in four sizes, are hand carved from one piece of wood. These puzzle stands are infinitely adjustable to hold shells, specimens, spheres, eggs, bowls and more. These stands spread out as wide as they are long, but are not recommended for heavier items. Moroccan Thuya Wood Egg or Ball Stands are hand made by local craftsmen from the burled wood root of the Thuya Tree, related to the coniferous Lebanon Cedar. This aromatic, exotic wood varies in color from golden brown to rich dark hues, each stand has a hand rubbed shellac satin finish. These stands will add elegance to your small to medium spheres, eggs, paperweights or art glass. Superb handcrafted Brazilian Exotic Hardwood Stands in x-small small, medium and large sizes, are solid wood with a beautiful high gloss finish. These are great for your upscale spheres, paperweights, marbles or eggs. X-Small stand holds 10mm to 40mm marbles/spheres, small stand holds 30mm to 60mm spheres, medium stand holds 45mm to 85mm spheres. 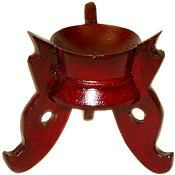 large stand holds 60mm to 110mm spheres. Brazilian Exotic Hardwood Stands are solid wood, handcrafted and available in x-small small, medium and large sizes with a beautiful high gloss finish. These are great for your upscale spheres, paperweights, marbles or eggs. X-Small stand holds 10mm to 40mm marbles/spheres, small stand holds 30mm to 60mm spheres. Versatile oriental dark walnut, high gloss finish wood stand. Great for spheres, marbles or eggs from 20mm or 3/4" up to 70mm or 2 3/4" diameter. Artistic and versatile Deluxe Tripod Rosewood Stand gives an old world quality to your favorite eggs, spheres or diamond paperweights. This unique stand can be used with either the base or top side up and will beautifully display diamond paperweights, eggs or crystal balls. Unique, hand made oriental wood stand with satin gloss rosewood finish.